In Latin America, being an indigenous environmentalist can be a deadly combination. So it should come as no surprise that Pope Francis is visiting Chile and Peru to speak out against the deforestation, mining, and land theft that’s threatening countless indigenous lives. After all, he’s been vocal about environmental issues in the past, especially as to how they relate to the world’s most vulnerable populations. 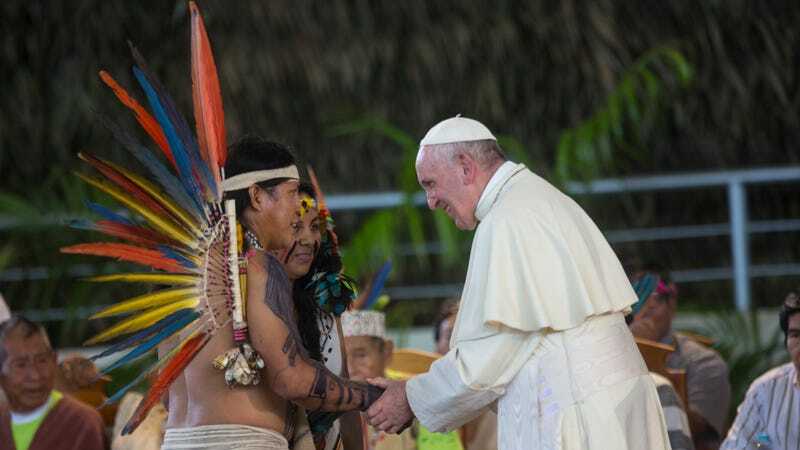 In Chile on Wednesday, the pope addressed the historic land struggles plaguing indigenous people, and on Friday he met with indigenous people around Puerto Maldonado, Peru, a section of Amazon rainforest near the Bolivian border. This area, specifically the Madre de Dios region, has been subject to a level of illegal gold mining that should break the church’s heart—and, quite literally, has devastated the Amazon. At least 270 square miles of forest are gone, and the once-lush land looks like a post-apocalyptic wasteland these days. About 10 percent of the Amazon Rainforest was lost to mining between 2005 and 2015, according to a study published last year. All the land lost in the rainforest to mining could take 500 years to recover, per The New York Times. The pope decried this lust for gold during his speech to the various indigenous groups, saying the “idols of avarice, money, and power” push people to mine for gold despite its varying risks, according to the Associated Press. He, instead, urged governments to take action against mining. He also called on them to treat tribes as equals and properly negotiate with tribal representatives when dealing with their land and cultural rights. When illegal miners come in and cut down these trees in search of gold, they’re not only releasing carbon into the atmosphere (and exacerbating climate change). They’re also destroying land on which people live. After the lands are mined, the mercury used to mine can leach into the groundwater system, eventually polluting waterways and other nearby communities that pull resources, such as fish, from them. In 2016, the Peruvian government declared a public emergency over the mercury contamination along the Madre de Dios River, which impacted about 48,000 people. In 2015, Pope Francis wrote his encyclical, Laudato si’, where he explicitly called out climate change, pollution, and their impacts on the world’s most vulnerable. Now, he’s putting those words into action as he visits the regions of the world where the situation is already a matter of life and death. Most indigenous peoples in the region aren’t Catholic, but they still value the weight the pope’s message holds in uplifting their struggle.